As you may have noticed, APIs are all the rage these days. Twitter attracts 15 billion API calls per day, Google and Facebook were pulling in 5 billion per day as of last year, Amazon currently stores over 260 billion objects in S3, and Saleforce.com receives 50 percent of its traffic through its API. You get the picture. Mashape, which is going into private beta today, hopes to ride this API surge to victory through a marketplace makes it simple for developers to discover, distribute, and consume all things API. Mashape, which was founded in November by Augusto Marietti, Marco Palladino and Mike Zonca, aims to be a little bit Etsy, a little bit Github by building a unified, all-in-one marketplace where users can find, sell, distribute, and hack on APIs. The platform makes it easy to list any JSON API using its simple wizard and provide it to a community of developers just waiting to get hackin’. Plus, there are 5 auto-generated client libraries, including PHP, Ruby, Python, Object C and Java. API consumers can use any API listed on Mashape via a single Developer Key and a standard interface, so that once you’ve learned how to consume an API on Mashape, you know how to consume then all. Developers can even test their APIs by using Mashape’s online Test Console. At this point, Mashape is supplying more than 110 APIs, both published and private, and has tallied more than 22K API searches. The APIs in stock range from stuff that helps you get your homework done to music services and photo filters — and even more obscure APIs like “DNA manipulation” or a “Nitro accelerator”. “We believe that APIs have no limits”, said Mashape Co-founder Augusto Marietti, “though I still have to figure out exactly what kind of API a ‘Nitro Accelerator’ is”. The APIs listed on Mashape are both free and for charge, and today the startup is launching a simple (and free) tool that enables users to monetize JSON APIs. Once a user has listed an API, they can set up billing with a single click. 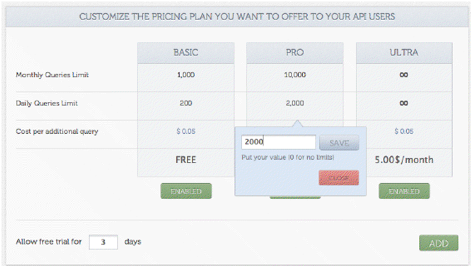 Users can choose monthly charges, give API call limits, and give a price per additional call. Pretty cool. For a market consisting mainly of enterprise solutions, the startup’s addition of social layers to its marketplace will strengthen its API community and come in handy for startups and independent developers. By building a social layer on top of APIs, Mashape also hopes to address the discoverability and trust issue through the ability to see what your friends are using. For all TechCrunch readers looking for a few coupons, go to Mashape signup on the homepage and insert your email address. You will be asked a question to which the answer is “var x”. Add the TC coupon, and voila!